Since I'm still the only one participating in the November +Flash Fiction Project and that's, well, not very nice for a group project, they will stop posting pictures at this time (presumable until NaNo is over). I'd still like to continue with this, though, since I'm already in my groove. So, it's on you now.I don't like choosing my own prompts, that doesn't feel right, and therefore I'm asking YOU, anyone who would like, to send me, or comment with, images you'd like me to use. It can be anything at all, I'm learning not to be picky. If I'll get any replies to this, I'm going to work through them chronologically, because I get into difficulties if I see more than one image at the same time. Just so you know. Nobody knew where it had come from. One morning, it had simply been there, a vending machine at the top of the drive. People didn't worry, of course; you never know why the city does things. No, they were quite grateful, even though it was hard to reach on foot since there was no pavement on this side of the street. A week later, a second vending machine had joined the first, and then another, and another. In the end, ten just fitted the drive from top to bottom, and the transport planning department sent some people to move the lane a little to the right to adjust for the space taken up by the machines. Naturally, they assumed people from another department had ordered them there for their very own reasons. None of the city workers ever passed the vending machines by night, and nobody paid any attention to the workers coming from their late and night shifts at the factory. Who would bother to watch them queue at the machines after work, who would notice their teeth decaying and their abdominal girths increasing? Well, their wives, if they had any, and they complained about the halitosis, but what where they to do? It was only with the alarming increase in diabetic emergencies at the factory that people started paying attention. The workers were told not to use the vending machines, switch to water or natural juices instead, but the situation deteriorated ever further. 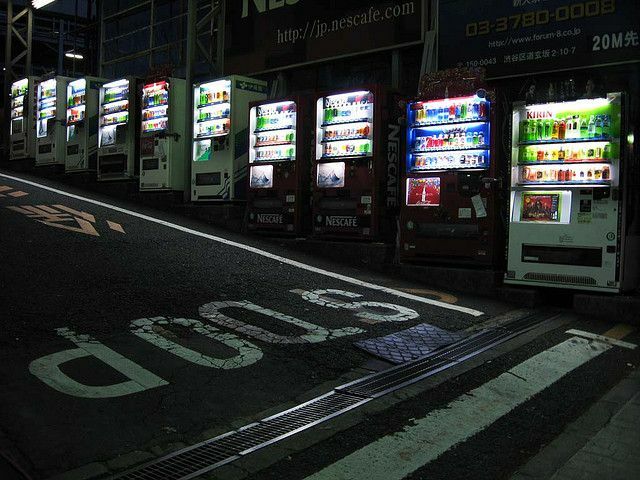 The vending machines were cut off from the power supply system then, but somehow it didn't seem to improve matters. It was only by chance that a street sweeper starting his day early passed by the machines and noticed that they were still working. "I wonder, shouldn't you be switched off?" he asked. They replied. "we cannot be switched off. we have to work. for money. we work the streets for money." The man recoiled as he heard them speak to him, he could not believe, who would ever... believe him? "come. give us money for drink. drink from us. it is good. you need it." "I, no... I..." He backed away further, tripped on a stone, stumbled and fell. His broom clattered to the ground beside him. "drink. it will give you strength. you are weak. you need sugar." Gasping for breath, fighting the urge to search for change in his pockets, he tried to get back to his feet. He never even heard the truck passing the gates before it hit him, disposing of the only witness that could have stopped the venging machines.